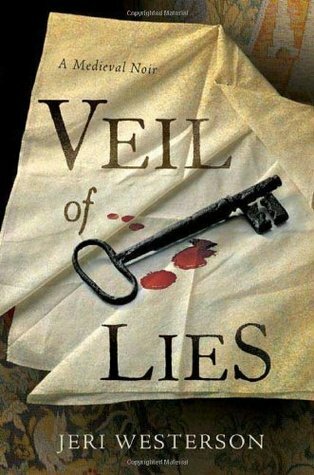 Veil of Lies is a medieval “whodunnit” that pits the wits of a disgraced knight against the equivalent of “the mob” as well as an elusive killer. The disgraced knight is one Crispin Guest, formerly of the House of Lancaster, but now of the less than salubrious streets of London. Known as “The Tracker”, against his better judgement, accepts a commission from a wealthy merchant who believes his wife is being unfaithful. Required to follow the man’s wife, what Crispin discovers confirms his employer’s concerns. When the merchant is found dead shortly after, suspicion falls on the lovely wife. But Crispin is not convinced by her guilt. When Crispin learns that the merchant was also in possession of a valuable holy relic, a veil believed to bear the impression of Christ’s face and which forces anyone in its vicinity to speak the truth, he understands there are darker forces at work. This is relic is something that other parties are willing to kill to possess. Suddenly, a great deal more than a wife’s honour and a man’s life is at stake. There’s no doubt Westerson brings the seamier side and brutality of this era London to vivid life in this tale of secrets, murder, and deception. The plot ticks along at a steady pace and with enough twists and turns to keep the reader guessing. As a hero, Crispin is somewhat wanting (which I also liked) as he struggles with his loss of status and the people he’s not only forced to reckon with daily, but how he’s perceived and treated by others as well. Crispin is an unapologetic snob who manages to seriously offend and thus offside those whose help and trust he needs, let alone those he likes. In that respect, the novel exposes the class system extant at the time and how much appearances and connections counted. The woman at the centre of the tale is also flawed, but I enjoyed reading a book that didn’t rely solely on binary characteristics to spin a good yarn – so much so, I’ve downloaded the next book in the Crispin Guest series. 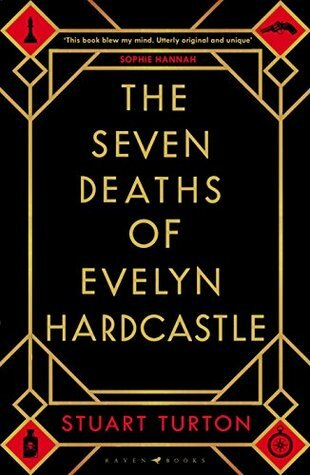 This is the second book I have read recently with “seven” in the title, the other being the Seven Husbands of Evelyn Hugo which I enjoyed very much. Turton’s book, which was originally entitled The Seven and a Half Deaths etc (now that’s an eye-grabber) is a very different proposition. Essentially a murder mystery, it is also so much more. It’s also an existential exploration of what it means to be human – different kinds – and the ways in which we suffer for our sins, seek redemption, and/or must face the consequences of our actions. The setting is a decaying manor house, Blackheath, in the English countryside. The period appears to be the 1920s or something akin to that. A a group of guests have gathered to celebrate or be part of a memorial of a gruesome death that occurred many years earlier, and which has affected the Hardcastle family ever since. When one of the guests, a man we think is called Aiden (reading the book will explain why we only “think”), learns that the hosts’ daughter, Evelyn, is to be murdered that night and he has to uncover the identity of the culprit or else remain trapped in the manor house, reliving the same day over forever, you wonder what on earth is going on. While I really appreciate the idea behind this plot and the writing (which was really lovely in parts and excellent throughout), I also reached a point I too would do anything to escape this hell. I found the story hard to get into and, when I did, I didn’t care enough about the characters as I would have liked. They were all shallow, unpleasant, oft-times confusing and the purpose behind this never-ending Groundhog style day, but from alternate perspectives, became exasperating. Having adored the BBC TV series, Poirot, starring David Suchet and having committed the literary cardinal sin of never reading one of Agatha Christie’s books featuring the Belgian detective (though I have read others), I thought I should give Sophie Hannah’s wonderfully titled novel, with the simply gorgeous art deco cover a whirl. 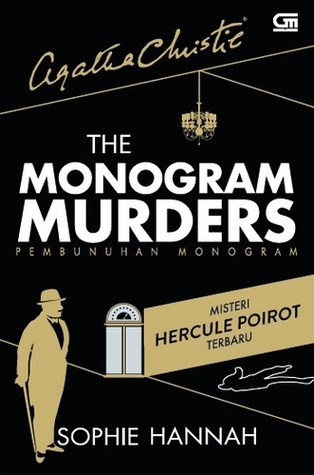 In this book, Poirot has, for some inexplicable reason, moved out of his accommodation and is living in a boarding house across the street where, conveniently, a young Scotland Yard detective, Edward Catchpool, is also staying. Acting on the recommendation of Catchpool, Poirot frequents the Pleasant Coffee House to take his meals. The book opens when Poirot is dining and a young, firghtened woman enters the coffee house and states that only when she is dead, will justice have been done before she exits, stage left. When Catchpool is called upon to investigate the mysterious death of three motel guests, who all died at the same time in their rooms, Poirot senses that the young woman’s fears and this case are linked and thus the scene is set for Poirot to not only use his “little grey cells’ to prove they are, but educate Catchpool in the finer points of investigation. Journeying from London to a small village in the British countryside, Poirot and Catchpool find the answers to their present mystery lie in the past. But it’s up to Poirot to help the inexperienced Catchpool build those temporal bridges and join the literally bloody dots. While I am not familiar with the style in which Agatha Christie wrote her Poirot books, there’s no doubt that when reading Hannah’s homage, it was easy to conjure a picture of Suchet as Poirot, fussing over his moustache, being particular about his things and places, so accurate was the dialogue and the descriptions of the vertically challenged, portly detective’s idiosyncrasies and ways of interacting with suspects. The language evoked a time and place very well as it did a range of eccentric British characters. The climactic scenes with the revelation of just “who dunnit” did drag slightly, but other than that, this was an easy, delightful read that evoked the past in a charming, porcelain tea-cup way that made reading the book an easy pleasure. In an earlier review o f Robotham’s works, I said they should come with a health warning as they render the reader unable to sleep. I want to correct that statement and instead recommend they be issued as a cure for narcolepsy, because I defy anyone to try and sleep while reading his latest work, Life or Death, because I sure as hell could not. While I will read anything this man writes, I initially thought this was to be another in his Joseph O’Loughlin series and kept waiting for one of my favourite fictive characters (and his cop buddy, Vincent Ruiz) to make an entry. They don’t. This novel isn’t part of the O’Loughlin series and I initially experienced a small flash of disappointment that was swiftly staunched. That’s because this novel is a tremendous standalone with a fabulous premise: why would a man escape from prison the day before he’s due to be released? That question is enough to arouse anyone’s curiousity, and I wondered how Robotham was going to pull off the story of Audie Palmer, a young man convicted of armed robbery ten years earlier and in which four people died, who flees his jail cell the day before he’s given state-sanctioned freedom for serving time. Reviled outside the prison, hounded endlessly within, Palmer’s life has been one of misery and hardship – so why does he make it worse by escaping? Why risk adding 20-25 years to his sentence by becoming a felon once more? Palmer’s escape sets in motion a series of events over which he appears to have no control. Hunted by the authorities and criminals alike, Palmer is on a mission, but will he succeed and what’s the nature of this mission? Why didn’t he just wait one more day and walk from behind bars a free man? This was a simply sensational tale. Taut, fast-paced, filled with believable characters, Robotham’s cracking dialogue, and original descriptions, I couldn’t put this down. Not only do the people come to life as the present and past unfold, but the different settings, the American landscape from the borders with Mexico to Texas, also develop a life of their own. You can smell the heat, taste the brackish water or the greasy eggs in an out-of-the-way diner, feel the sand, hear the flyscreens squeaking on rusty hinges as forlorn and deadbeat extras make an appearance. Despite having a horrible headache that required codeine, I stayed up till 3am to finish the book. I had to know what happened to Audie (who you come to champion so hard it hurts! ), I had to know why he did what he did. The plot doesn’t only thicken in this novel, as back-stories and flashbacks weave their way in, laying solid foundations upon which the present is built, it sets harder than concrete making the conclusion one, though you don’t see it coming until the end, marvellously strong and utterly satisfying. 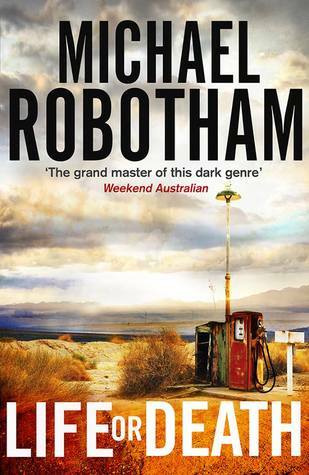 The only downside is that I have finished the damn thing and now have a long wait for Robotham’s next book. But if you like crime novels, edge of your seat thrillers, character driven works that also pay homage to setting, and are just superbly written, then I cannot recommend this highly enough. What an unusual book this was. Highly acclaimed and placed within the crime genre, I admit the title and the accolades Joël Dicker has received intrigued me. 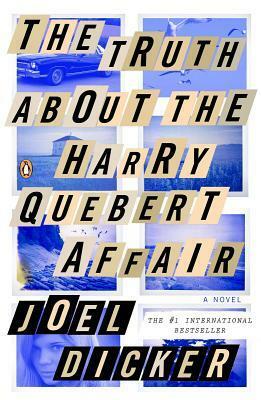 Yet, when I began reading The Trut h About the Harry Quebert Affair, my initial response was “I am not going to enjoy this book.” There was something simplistic about the writing style, the repetitiveness that begins early in the novel, and it both irked me but also piqued my interest – what on earth is the writer doing? Not very far into the narrative, I became hooked and stayed captivated to the very end. So, what’s the book about and why all the hype surrounding it? The Truth About the Harry Quebert Affair is ostensibly a murder-mystery. It tells the story of a successful young writer, Marcus Goldman who, having difficulty producing his much-anticipated second novel, seeks the reassurance and help of his mentor, Harry Quebert, a great novelist who, thirty-two years earlier, produced what’s since become an American classic, The Origin of Evil. While staying with Harry in New Hampshire, Marcus uncovers a dreadful secret – one that could destroy Harry’s reputation – that is (this is not a spoiler, as it’s in the blurb) that thirty-three years earlier, his great mentor had an affair with a fifteen-year-old girl named Nola Kellergan – a girl who disappeared the night she and Harry were meant to elope, never to be seen again. Segueing from the present to the 1970s, Dicker evokes not just the past with a dreamy reality, but a town on the threshold of having its innocence destroyed, of dreams about to be shattered, and families on the brink of imploding. Atmospheric, moody and creating both a claustrophobic intensity and yet able to summon the beauty of the natural surroundings, the reader is drawn into the tale of Nola and Harry, those who come into their orbit, and all the different versions of what happened that Marcus uncovers. Through his eyes and the words of Harry’s novel and, as it starts to be born, Marcus’ new one as well, we’re given insights into the past, present and the terrible possibilities of that fateful time back in the 1970s and the consequences of what unfolded in the here and now. The novel plays with notions of truth and fiction – something the title itself announces when it boldly asserts it’s a “truth” and yet, it’s also a work of fiction. And so, the reader is plunged into liminal space where the lines between the two – between fact and fiction, truth and lies, are constantly blurred. As much a treatise on writing and the writer’s craft; it’s a love story that, despite the unsavoury nature of the love (older man and not yet legal girl), doesn’t have you squirming in disgust. It is also about role models and mentors, and the relationships we form with them. Above all, it’s about memory and the stories that shape our recollections – how we tell them, how we remember them, how they structure our lives and the way we understand and read each other. All the characters are beautifully and realistically drawn – particularly young, passionate and fascinating Nola – the object of everyone’s attention. The only weakness in the novel (apart from some of the repetitiveness – but that also works to play with the reader’s and character’s heads) is Marcus’ mother. Now, I know this type of Jewish mamma – I am Jewish and there’s no doubt, my mother and many of the women of her acquaintance rang familiar as I read the dialogue and interactions between mother and son. But she also grated in a book that took pains to construct fully-rounded and realised people. In that sense, she read more like a comic foil (though why, I don’t know), a caricature rather than a character and as such belonged more in a re-run of the US sitcom The Nanny than in the pages of this wonderfully disturbing, tricksy and clever novel. Skilfully plotted, deceptively simply written (it is very easy to read), this is a terrific book packed with twists, turns and surprises that will frustrate, shock and delight. Four and half stars (the irritating and, frankly, misplaced mother forces me to take away half a star! ).